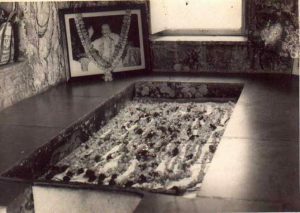 Although Baba’s body never showed any sign of deterioration, the mandali decided that on the seventh day the crypt should be closed. The atmosphere of grief had become so suffocating that we could no longer postpone the inevitable moment of Baba’s interment. It was 7th February, the date of Baba’s birthday that year according to the Zoroastrian calendar. As His precious body was covered, it seemed as if the very essence which had sustained our lives was being ripped away from us. We cried silently, knowing Baba wanted us to accept what had happened. Beloved Baba was our heart and soul, our only light, and we all felt lost but, like machines, we continued with whatever tasks needed to be done. Even though He had dropped His physical body, Baba was still asking for our complete resignation, expecting us to surrender to His wish, even at this time of helplessness and hopelessness. We were orphans now, yet in all our anguish Baba’s gentle, loving hands were ever on us. Later we heard stories from Baba lovers around the world of unusual events occurring at the time Baba dropped His body, but the most amazing was the account we read in the papers of the heavy rainfall in Mecca, ordinarily a desert. Muslims on pilgrimage were unable to approach the flooded Kaaba for seven days, 1st February until 7th February, the exact time that Beloved Baba’s body was lying in state.